Dear Powers That Be, this is my second or third petition entreating you to give Claudia Gray all the money and let her write all the Star Wars she wants to write, please and thank you. This book feels very, very YA and it surprised the hell out of me. In the beginning, Leia is a mopey, angsty sixteen-year-old politicking with the ease of long practice while her teenage hormones rage beneath her poised exterior. Basically, Gray took everyone’s favorite space princess and made her even more relatable, which I had no idea was even possible. (Surprise!) Leia feels neglected by her parents, she’s desperate to be noticed by them, she meets a boy she likes, and she struggles with her sense of self. 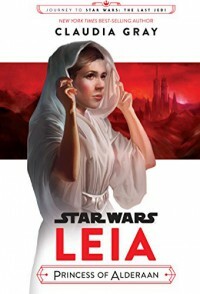 It’s stock standard YA fare woven skillfully into an engaging tale of Leia learning to navigate the pitfalls of Imperial politics as she comes of age during the Rebellion’s tumultuous infancy. Some of my favorite parts were the descriptions of Leia’s home life in the royal palace on Alderaan and her relationship with her adoptive parents, Bail and Breha. Bail gets most of the fanfare in the movies and novels, but let me tell you, Queen Breha is so badass she ought to eclipse him. Not to diminish Bail’s contributions to the galaxy far, far away, but they should be erecting statues of Breha too. Bigger, shinier statues. Oh, and about Amilyn Holdo. We get to see her as a gangly, awkward teenager and she is basically Luna Lovegood. It explains SO. MUCH. I love her even more now. I would have scored the book a solid 9 out of 10 until I got to the last line. Damn it, Claudia. That was a cheap shot. Minus one point. Feel free to earn it back with your next Star Wars novel, Master and Apprentice, a tale of Qui-Gon and Obi-Wan, now available for pre-order. Everybody go buy it so they keep giving Claudia Gray all the money to write all the Star Wars, please and thank you.